You can add bitmap texture colour swatches to your palette. This allows you to fill zones in your artwork with custom patterns and textures. From the Colour menu, select Colours > New Texture or click the New Texture button. Browse for a PSD or TGA bitmap file created with a third party software and click Open. The texture is added to the colour list. You can also replace a texture once it is painted. 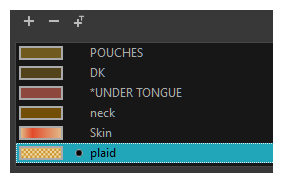 If you decide to make the character’s shirt wool instead of plaid, just update the texture file in the swatch and the entire project updates. 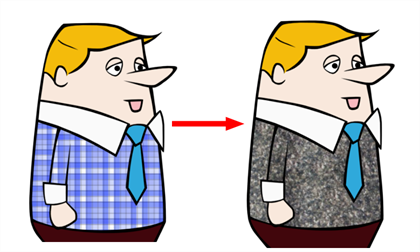 Any transformation previously applied to the texture’s position in your drawings will be kept. NOTE To learn how to reposition the textured zones in your drawings, see About the Edit Gradient and Texture Tool.